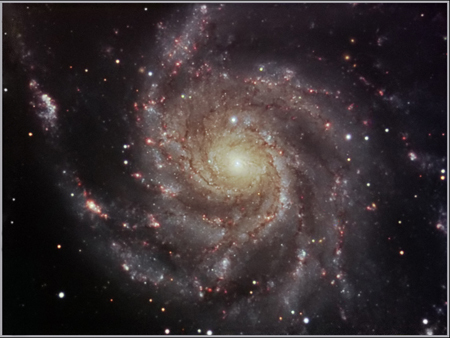 M101, The 'Pinwheel Galaxy', is a face-on type Sc spiral galaxy 27 million light years from us, and was discovered by Pierre Mechan on the 27th March 1781. 227 years and 11 days later I decided to have a crack at imaging it! Acquired with MaXIM DL, processed in Photoshop CS2. Total luminance - 4 hrs 9 minutes. Red. 20 x 3 minutes binned 2x2. Green. 15 x 3 minutes binned 2x2. Blue. 16 x 200 seconds binned 2x2.